For years, Rudolph the Red-Nosed Reindeer has brightened the holidays! Celebrating the special place it holds the hearts of Christmas lovers, Jim Shore reimagines the film's most iconic scenes in his signature folk art style. Snow-covered trees provide a romantic background for Clarice and Rudolph's loving nuzzle. 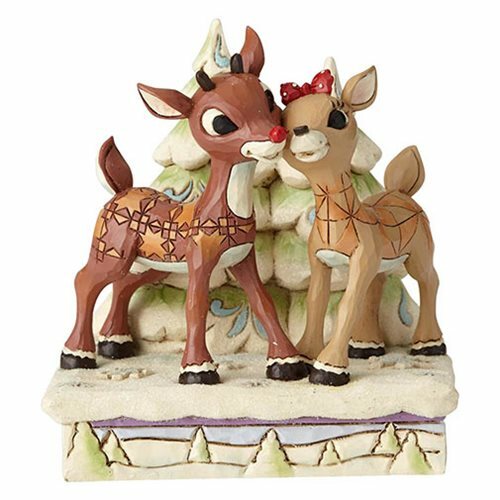 This heartwarming scene is handcrafted in high-quality stone resin and hand-painted with charming folk art motifs. It makes a beautiful gift for Rudolph fans of all ages. The Rudolph the Red-Nosed Reindeer Rudolph and Clarice by Trees Statue by Jim Shore measures about 5-inches tall x 4 1/2-inches long x 4 1/2-inches wide.